Founded in 1876, Hathaway Brown School is the oldest college-preparatory school for girls in Ohio. The new Carol and John Butler Aquatic Center was constructed to commemorate their 125th anniversary milestone. Counsilman-Hunsaker, in association with Westlake Reed Leskosky and Graham Gund Architects, were selected to design the 20,000 sq. ft. cutting-edge aquatic center. Hathaway Brown is one of a handful of girls’ prep schools in the nation with its own aquatic facility. An on-campus swimming pool allows the Hathaway Brown community to meet life-long fitness, health, and wellness needs. In addition to meeting the school’s competitive swimming and diving programming objectives, therapeutic and cross-training needs are also fulfilled. 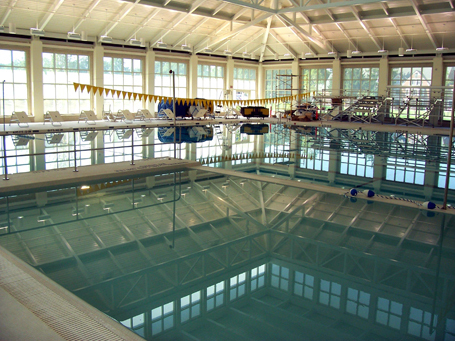 The aquatic center provides for other educational and enrichment activities as well such as synchronized swimming, water polo, water aerobics, scuba diving, canoeing, and kayaking.